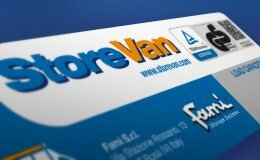 Roof bars and roof racks for transporting material on van roofs. 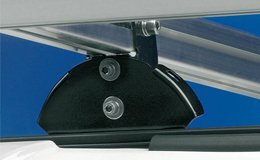 Ladder racks with servo-assisted lifting and lowering for completely safe transportation of ladders on commercial vehicles. 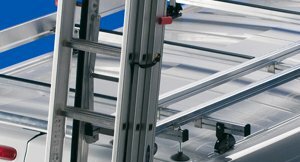 Roof and ladder racks with prestigious TÜV-GS certification. Fully modular and flexible system completely built in aluminum and stainless steel. Adaptable to a wide range of vehicles. Structure entirely made of aluminium and stainless steel. 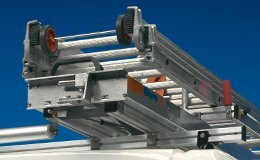 Modular and specific fixing connectors to adapt the structure of the ladder rack to the rounded shape of the vehicle’s roof top. 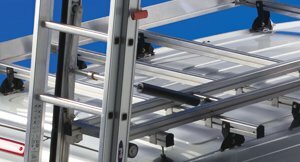 The hydraulic brake and gas springs make the up and down movements of the Aladin ladder rack carriage easy and not heavy. On both the roof rack and ladder rack carriage there is a load capacity label and both products are GS – TÜV certified. 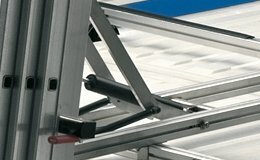 Balanced system for ladders up to 60 Kg. 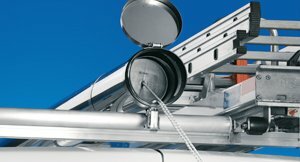 Lowering system with brake for ladders up to 60 Kg. 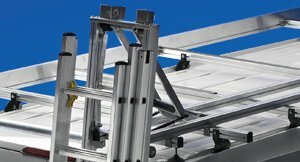 Servo assisted lowering and lifting system for ladders up to 60 Kg.